The interchange was designed for 95 to continue north through Fowl Meadow as the Southwest Expressway into Boston. As we all know, that never happened. Same thing is true for the Route 3/128 interchange in Burlington. Route 3 was supposed to continue south through Lexington to Route 2. Well, Lexington already is cut up by two freeways, Route 128 and Route 2, so there was precedent. I'm glad it didn't happen. Not really 128 widening per se, but couldn't find anywhere else to put it. Also won't be funded for 14 more years so don't get excited. More than 10 years after it was unveiled at a raucous meeting at the old Woburn Memorial High School, the project to expand the notorious cloverleaf connecting I-93 and Route 128 isn’t dead, but it’s not moving forward quickly, either. According to MassDOT, the state’s transportation agency, the project is slated for construction funding sometime between 2026-30, when the cost could exceed $500 million. In the meantime, environmental work continues at the site in preparation for the project, construction of which will primarily impact Woburn, Reading, Wakefield and Stoneham, but will have effects from Boston to New Hampshire, and from Waltham to the North Shore. The dangerousness of the intersection was underscored as recently as Monday night, when a car and a tanker truck collided, spilling some 8,000 gallons of fuel onto Route 128 just south of I-93. Public safety crews scrambled to contain the fuel, averting what could have been a major disaster. Built in 1972, the I-93/Route 128 cloverleaf was designed to accommodate about 169,000 vehicles per day, but three decades later was handling more than twice that amount of traffic, making it the busiest and one of the most dangerous intersections in the state. Of primary concern were the ramps connecting the two highways, which according to MassDOT have “substandard radii” that create abnormal weaving patterns, which in turn creates backups. Particularly impacted are commuters heading south in the morning and north in the evening on Route 128. It is not unusual for traffic heading south on Route 128 to be backed up beyond Route 1 in Lynnfield during the morning rush, even though the highway expands from three lanes to four after the interchange. Bad weather and accidents exacerbate the commute. Traffic on Route 93 is also impacted, and it is not unusual for the southbound side of the highway to be jammed from Boston to beyond the Route 128 interchange. In the evening, the commute can extend well beyond Burlington, where Route 3 funnels into Route 128, and as far back as Route 2. Route 93 north is also often reduced to a slow crawl as commuters from Boston head toward the suburbs and beyond. Seasoned commuters who know the back roads get off the highway and take back roads through the various towns through which Route 128 flows, creating more traffic and increasing the risk on the smaller, local streets that were not designed to accommodate such a large influx of vehicles. In 2001, MassDOT, then known as Mass. Highway, made a presentation to the public in the auditorium of the old Woburn High that resulted in uproar, due to the “significant” takings of private property, which would have essentially wiped out neighborhoods in Reading and East Woburn. Famously, one Woburn resident compared Mass. Highway to a charging rhino, leaving him with the option of shooting the beast or being gored with its horn. Not surprisingly, Mass. Highway scrapped its original proposal and started working with the neighbors, who formed citizens groups, primarily THAG (Tri-Community Action Group) and Reading-based PRESERVE. 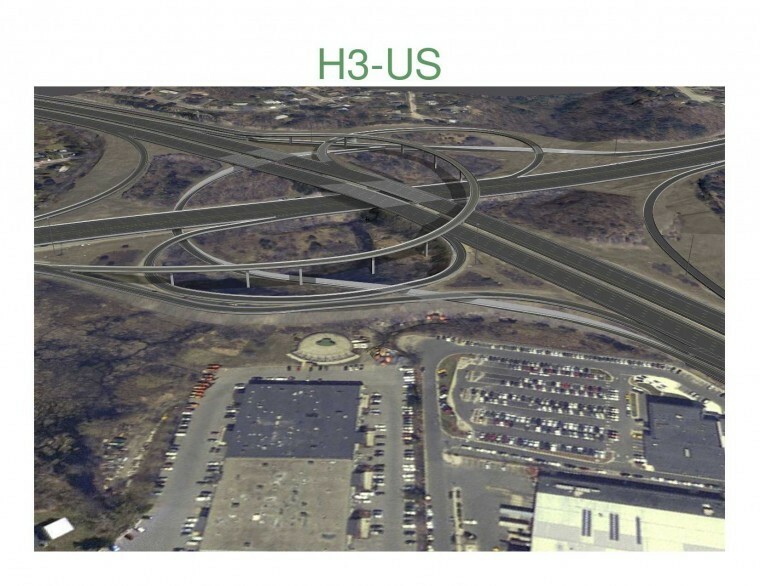 Different versions of the revised intersection were considered and ultimately two were chosen - known as H3-OS and H3-US - one with two new interchange ramps over the highways, and the other with one ramp under and one ramp over I-93 and Route 128. However, by that time the economy went deeper into the recession, and the project - which was initially expected to cost in the range of $160 million - went into a period of relative dormancy. The official website set up by Mass. Highway for the project - www.9395info.com - still lists on its task force roster Thomas McLaughlin as Woburn’s mayor, and Robert Havern as a state senator, though neither has been in office for three years. There are no meetings listed on the schedule, though according to Woburn Planning Director Edmund Tarallo, the Boston Region Metropolitan Planning Organization (MPO) discussed the cloverleaf project at a meeting as recently as three months ago. MPO is responsible for conducting the federally required metropolitan transportation-planning process (often called the 3C—continuing, cooperative, and comprehensive—process) for the Boston metropolitan area. About $70,000 has been budgeted this year for environmental preparation work, as part of the final environmental report that was issued in 2007. The required environmental studies are taking place, according to Woburn City Council member Darlene Mercer-Bruen, who lives in the Richard Circle neighborhood that was originally discussed among the areas that would be taken by eminent domain. There may be, however, “smaller aspects of the project” taking place once the environmental review is complete. Tarallo said the estimated the cost of the project in 2012 dollars is $276 million, and taking inflation into consideration the project may end up with a price tag of slightly more than $537 million, which would account for half the federal funding the state will receive. Instead of spending that much money to revamp the interchange, I was thinking an interim solution could be to close Exits 36 and 38 on 128? This would eliminate the dangerous weaving caused by traffic entering/exiting at those interchanges and traffic destined for 93. Then, they could even make the right lane on both 128 and 93 into a "local" set up where the slower moving weaves between 128 and 93 would occur, leaving the left three lanes for through traffic. Omaja -- that wouldn't really help much -- as the studies associated with the project have shown - - Each of the leafs of the clover all have the same problems of exiting and entering traffic crossing and backing up onto the 2 outermost lanes which can not be aleviated without a segregation of the thru traffic from ramp traffic. I think the best which can be done on an interim basis is to open the breakdown lanes for exit / entrance use about 1/2 mile from the clover leaf allowing "double stacking" to occur in only the outermost lane and the breakdown lane. However, real relief only comes when the fly-over / under ramps are introduced and that means the full project -- a lot of money and unfortuantely probably not for many years. I don't understand how this hasn't received a higher priority-- the cost per user is a fraction of transit projects. Also, shouldn't 128 be widened to 8 lanes much further down past the interchange? The bridges are all wide enough for 8 lanes for quite a distance. It should be widened to the point where 8 lanes are no longer necessary for the traffic load and the bottleneck won't be a major problem. My guess: that means having at least the 4th lane in each direction merge to/from I-95 proper in Peabody, but I haven't seen the numbers. What I proposed would solve exactly the same problems you've just cited. Obviously not a permanent solution, but certainly much cheaper than a full rebuild and interim relief for people traversing the area. How will any of that solve the limited sight lines and very small distances between the 93-95 interchange and neighboring exits? Opening up the shoulders for travel would be an absolute disaster, even on an interim basis. Opening up the shoulders for travel would be an absolute disaster, even on an interim basis. You won't know if it's a disaster until it's tried for a few months. If it works, it's a hell of a lot cheaper than rebuilding an interchange. Can't do that. Latest revision of the MUTCD outlaws breakdown lane travel on new construction. MA is grandfathered for the existing miles it allows, but it cannot add more. Now, the rules get very bendy if they simply re-stripe for no shoulder because that technically isn't altering the roadway's footprint in any way, but that means going permanently no-shoulder there. The rush hour-only flex option with the breakdown lanes definitely isn't available anymore. They either take the shoulder all of the time, or take the shoulder none of the time. I don't think that's realistic, tell Stoneham and Reading they can't get on 95 from Main st. They'd fight that one down in a heart beat. Pretty sure there are no two lane loops anywhere in the Northeast, and probably only a handful anywhere in the US. Taking a shoulder to make a two-lane loop ramp? Unheard of. It would be a nightmare and wouldn't do much - if anything - to alleviate issues of weaving and interchanges spaced too closely together. Apparently there's no Interstate 28 in existence - maybe we could give non-serious consideration to violating numbering convention so that we can have Interstate 128. On a more serious note, I think if you're going to change any designations, 93 and 95 should be concurrent up through the Central Artery, and 128 changed to a spur interstate. It makes more sense that way - 95 is the major highway for the Eastern Seaboard and (absent the argument over whether or not this is a good thing) passes through most other major cities. As far as I can tell, Boston is the only city on the entire 95 corridor that has a highway running through it but doesn't have 95, and it's also the only major city that 95 actually belts around. I'm also a fan of changing the road designations because - unlike other highway projects - the only costs are labor and what it takes to make the new signage. Upgrading non-interstates to Interstate standards is a lot trickier, mind you. There is precedent for this, although I-128 would be considerably longer. Is there precedent for a spur Interstate to have concurrency with a major (ie 2-digit) Interstate, as well? I would like to see the 293 designation in NH extended over Route 101 as well, but this would require a brief stretch where 293 and 93 are concurrent. With its parent route? AFAIK no. Doesn't mean it couldn't happen, but 101 would probably be designated 193 if it were to receive an Interstate designation. Yes. 101 would have to be an odd-numbered prefix. 293 is legal in "spirit" of the rules for supplanting US 3 to 128 because the 495 and 128 connections loop back to 93. They aren't ironclad about even-numbered prefixes touching on both ends (witness I-290...even in its original proposal it didn't directly retouch the Pike on the east end), so long as it connects to a straightforward shot down another crisscrossing interstate. I'm pretty sure the current E-W segment of 293 between US3 and 93 couldn't share the same number with an x93'ing of NH101, though. Two different roads, two different purposes. It only makes sense in the original 101 expressway proposal which had it continuing west to Keene and Brattleboro.